Award Presentation From L: ASMFC Chair Paul Diodati, Dr. Alexei Sharov, Jim Gartland, ASMFC Awards Committee Chair Jack Travelstead, and ASMFC Executive Director Bob Beal. Photo courtesy ASMFC. ChesMMAP Cruise Principal Investigators Jim Gartland (L) and Chris Bonzek (R) with a net full of dead man's fingers. Photo courtesy VIMS. Trawl Net Jim Gartland prepares to unload a trawl net full of white perch during a ChesMMAP cruise. Photo courtesy VIMS. The Atlantic States Marine Fisheries Commission has presented Jim Gartland of the Virginia Institute of Marine Science with one of two Annual Awards of Excellence for his outstanding contributions to the field of fisheries science. The ASMFC was established by the 15 Atlantic coastal states in 1942 for the conservation and management of their shared migratory fishery resources. Its jurisdiction covers near-shore waters from Florida to Maine. ASMFC honored Gartland for his exemplary management of the Multispecies Fisheries Research Program at VIMS, which comprises three large-scale research surveys—ChesMMAP in Chesapeake Bay, NEAMAP in the coastal waters from Cape Hatteras to New England, and the VIMS Shark Longline Survey. 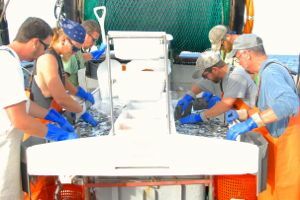 Data from the surveys underlie the stock assessments that are used to sustainably manage commercially, recreationally, and ecologically important species of fish and shellfish along the Atlantic seaboard. The other awardee was Dr. Alexei Sharov, a biostatistician with the Maryland Department of Natural Resources’ Estuarine and Marine Fisheries Division, who was recognized for his work with striped bass and menhaden. 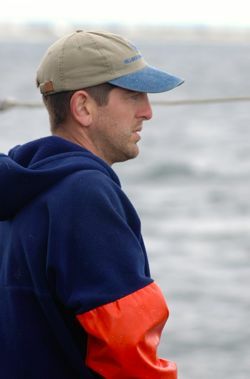 Gartland earned his Master’s degree from William & May’s School of Marine Science at VIMS in 2002. He began managing the ChesMMAP survey that year, assumed management of the NEAMAP survey when it began at VIMS in 2006, and the VIMS Shark Longline Survey in 2011. He now oversees all aspects of these surveys, as well as post-cruise processing of samples in the laboratory. To illustrate the scope of that work, the ASMFC notes that in 2009 alone, staff in the Multispecies Fisheries program at VIMS conducted more than 700 trawl tows in Chesapeake Bay and along the Atlantic coast; collected approximately 10,000 pairs of otoliths for fish-ageing studies (these ear bones contain annual bands similar to tree rings); and analyzed the contents of roughly 9,500 fish stomachs for dietary insights. Gartland reckons that he has spent a collective total of 601 days at sea during his 12 years on the research staff at VIMS. The ASMFC also recognized Gartland for leading ChesMMAP’s collection of tissue samples from Atlantic striped bass, which have subsequently been used to help monitor the prevalence of a bacterial disease called mycobacteriosis in this popular species. Later analysis of these samples resulted in the first documented case of mortality caused by a chronic disease in a wild finfish population. In addition to his work on the ChesMMAP, NEAMAP, and Longline surveys, Gartland also serves Virginia and the nation through participation on a number of ASMFC committees. He is a member of the ASMFC’s Fishing Gear Technology Working Group and its Management and Science Committee, and chairs the ASMFC NEAMAP Operations Committee. He was appointed to all three committees by the Virginia Marine Resources Commission.